We love noodles as light lunch meals. This classic Sichuan Dandan noodles (擔擔麵 in Chinese) is one of our favourites. 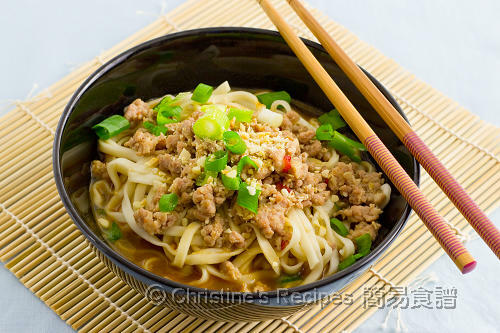 Dandan noodles (擔擔麵 in Chinese) is a classic Sichuan cuisine. The spicy sauce as the key element makes this noodle dish so addictively delicious. Firstly, prepare fragrant sesame sauce. Sesame paste is regarded as a must add ingredient of the spicy sauce. Then stir-fry and cook minced pork. 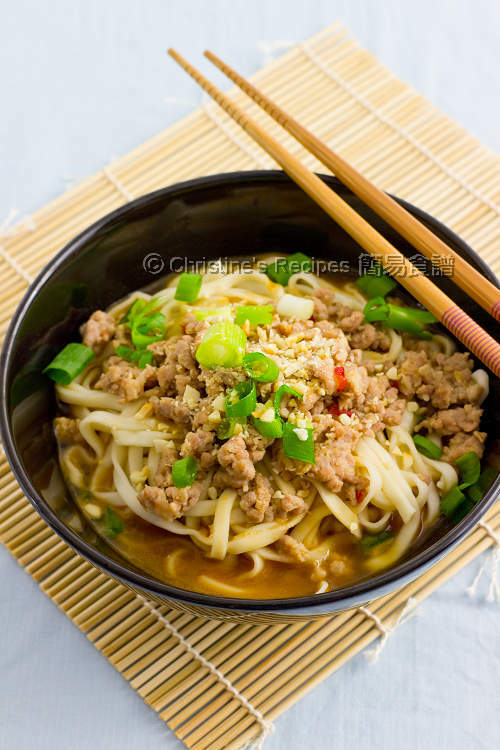 When serve, put the cooked pork, sprinkle spring onions on top of noodles. 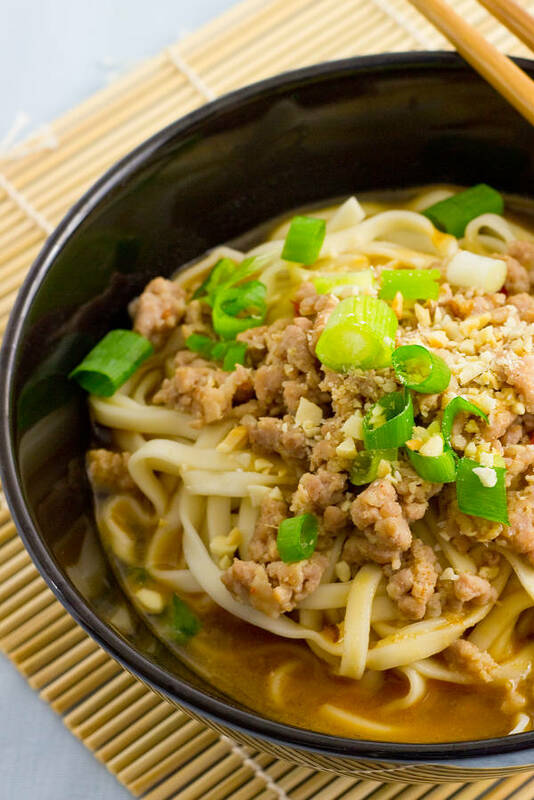 Not too long, you can enjoy a bowl of classic and delicious Dandan noodles. So, along the way of taking every bite of the springy noodles, you can smell the strong sesame aroma. If you’re a fan of sesame, this noodle dish is for you. Some people even like to add a bit of peanut butter. Why not give it a go for this sensational noodle soup? Combine the pork with the marinade. Set aside for about 15 minutes. Fry the peanuts in a small pan without any oil, until aromatic and lightly brown. Roughly chop them. Set aside. Combine all the ingredients of the sauce in a cup. Cook the noodles and rinse with cold water according to the instructions on packaging. Drain well and divide them into 2 to 3 serving bowls. Set aside. Heat oil in a wok or frying pan. Saute the ginger, garlic and shallot until aromatic over medium heat. Add the pork and stir fry until the surface turns white. Pour in the chicken stock. Bring it to a boil. Add the sauce and combine well. 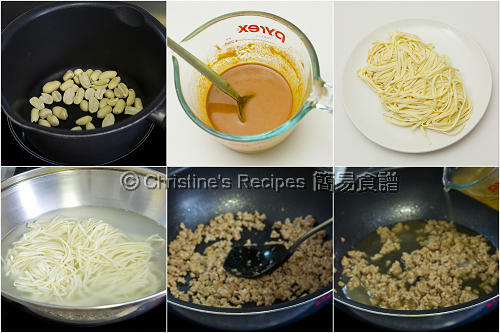 Divide the soup and ladle on top of the noodles. Sprinkle the peanuts and spring onion. Serve immediately. The sauce is the soul element of this noodle dish. Don’t skip the sesame paste. You can easily get it from any Asian grocers. You might like adjust the amount of chilli oil and chilli bean sauce according to personal preference. Don’t ever over-cook the white noodles. The noodles should be rinse in cold water immediately once they’re finished blanching. This step will help prevent the noodles turn mushy. You might replace the white noodles with udon noodles, that taste equally good. Black vinegar is available at Asian grocers, and can be replaced with white vinegar if you can’t find any. I love dandan noodles but didn't know that the peanut paste is one of the key ingredients. What a delicious bowl of noodles! This is one dish I am going to make for my daughter, thanks! This is my favourite dish! This is one of my kids favourite. I'll be trying this recipe. Is sesame paste the same as tahini? I used the Asian sesame paste. Think that tahini is a bit different from Asian one. I used tahini for this recipe, and also for hummus, baba ganoush... all turn out great. Next time if you could find the Asian sesame paste, try the authentic taste. You'll love it. I made this yesterday, and it ROCKED! Couldn't find Shanghai noodles, but didn't want the "fat" udon. Found a dried "Inaka Udon Noodles" and it worked out great. LOVE this recipe. This recipe works for udon noodles as well. would peanut butter work in place of the sesame paste? Some people add peanut butter as well, but never skip sesame paste. The sesame paste is a must ingredient. What kind of noodles are being use for this recipe. Already stated in the recipe. Please take a look again. Hi, Christine.. Thanks for your nice blog.. I like all your recipes and methods.. They make my cooking days being easy and fun 😍 (I'm begginer in cooking n baking ).. Always hope all the best for you.. Thanks for sharing the receipe. What are the leading brands of sesame paste ? I will try to find them in Malaysia. I have not bought sesame paste before. I used 品珍 sesame paste. If you can't find it in Malaysia, you may try any brands you like. Hi Christine, is peppercorn chilli oil called 花椒油 in Chinese? I saw them in Asia supermarkets sometimes. Thanks. Yes, it's called 花椒辣油. Yours work too. You can use any chilli oil anyway. Made this for dinner tonight after seeing it. It was delicious! Thank you for sharing!